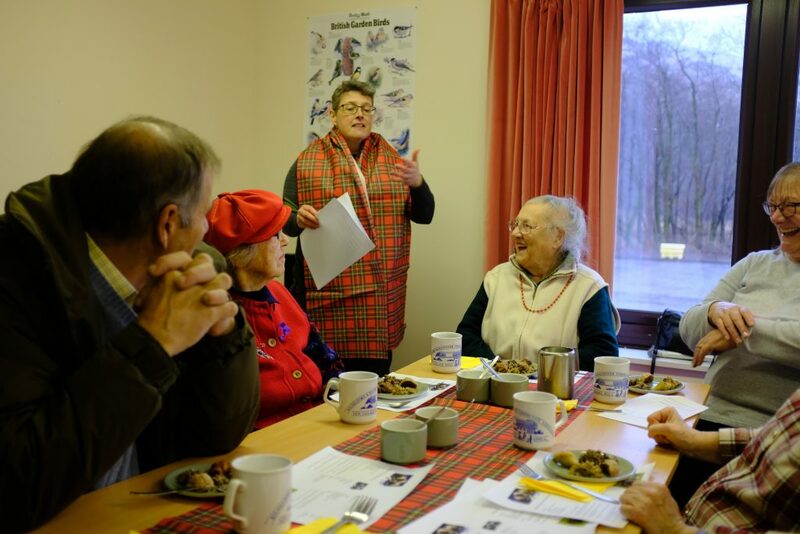 We provided a range of activities for carers living in rural and remote areas across Oban, Lorn and the Isles, enabling the carers to get a break from their caring role, focus on their own health and wellbeing and enable opportunities to develop enduring peer support. We have delivered a combination of activities including monthly 'Time for Me' groups in local community settings such as village halls. Areas include Kilmelford, Tobermory, Dalmally and Appin as well as activities on Tiree. The Time for Me groups offers a balance of activities and interest areas with everything from art sessions to reminiscence time on the calendar. We have offered therapies to carers across the rural mainland and islands of North Argyll at a time and a place that suits them, from massage on Mull to gym-based therapies on Tiree. We have also delivered a residential week on Tiree for carers incorporating a creative writing project for carers as part of a residential trip to Tiree. Both carers and those they care for have participated in the groups. We actively opened the rural mainland groups out to the wider community and provided a venue for the carer and those they care for to have supported time together and continue to have positive time together and build memories together. We did this to encourage yet unidentified carers to have opportunities to connect with support services. This has worked extremely well with carers registering for services that previously were unknown to us, and at times we have been able to signpost cared for to services also. We advertised groups on social media, posters and through partners such as local GP practices, social workers and communities. Our network of rurally and island-based carer support workers also supported us in raising awareness of the activities. Key to our work was partnership working with health and social care staff, community champions and colleagues from third sector working locally. By listening to the needs and wants of the groups we were supporting we were able to access support from colleagues eg. Lorn Oban Healthy Options supported with health sessions, and we encouraged staff to develop their own skills in support of the groups. We also were able to call on support from local communities such as Dalmally Primary School to entertain at one of our events showing their Carol singing to a delighted group - all sides enjoying the experience greatly. Reaching out and engaging with new families, by opening groups up to offer activities for cared for we have seen a significant increase in attendance and newly identified carers. This is significant learning from us and a new approach. We have witnessed how much people have enjoyed time out together as well as carers themselves. Running inclusive groups on subjects like reminiscence and ‘Playlist for Life’ is of so much extra value to carers, and it is wonderful for carers to be able to watch their cared for engaging with people again, and being part of a shared experience. We would like to build on this. Partnership working continues to strengthen the project and working more closely with colleagues particularly in Health enables us to lobby on behalf of carers and also share further what work is going on in our communities and health colleagues are referring much more regularly as a result of this. 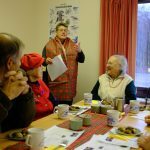 Creative Breaks funding is significant to North Argyll Carers Centre as it enables us to continue delivering and developing services to carers in rural and remote areas. To be able to continue committing to bringing services to people but more than that to keep developing these service in answer to evaluation is significant and can be life changing for carers and those they support. We have found that the Creative Breaks funding can act as a catalyst for other exciting projects such as a Book Project following our respite break. Without that funding and inspirational time for carers, we would not have the legacy that now exists from that. Two of our staff team travelled to the ISBA Conference in Iceland to present on the work we had undertaken as part of Creative Breaks. This was a fantastic and inspiring staff development opportunity, to share our story, to feel confidence in presenting our story and to come back with new ideas and synergies for ongoing support of carers. Carers will be enabled to access therapies and counselling across rural and remote areas and feel an improvement in their wellbeing and report reduced stress levels. This has been achieved with carers from across the area having access to therapies and counselling in the areas that they live. By engaging with local therapists and counsellors as well as those working from North Argyll Carers Centre as a base, we offered face to face/ skype and telephone counselling and therapies from wellness gym and fitness to massage, shiatsu and whatever the carer has identified. We have noted reach of those accessing therapies and counselling and the positive feedback from those who have been enabled to do this. Carer from island setting moved back to the island to look after parents and felt overwhelmed with move to island, loss of previous employment and lifestyle. The carer felt overwhelmed and said 'lost myself'. Through links with our island Carer Support Worker it was identified that fitness had been an extremely vital part of life before caring role. We linked with an island based therapist for one to one and group fitness enabling this carer to access this and re-establish fitness routine. This was possible as the therapist could work flexibly and in time carer has moved on to group sessions enabling social time as well as personal fitness. The carer reports feeling more able to continue in his role, and it has encouraged him to seek regular respite and he feels he is coping better with what is an ever increasing role and has taken back something from himself alongside his caring role and can now approach it with greater confidence. This process has also enabled him to connect closer with other support in the community. Carers will have the opportunity to access a residential respite break or be part of a shorter creative therapies writing/ photography project. ‘Project Freedom’, carers residential photography & writing retreat, Tiree. A group of 7 carers spent 5 nights staying on Tiree, with creative writing and photography classes throughout the stay. Travelling to another island, where they were looked after for the whole of their stay gave them time to be creative without any pressure. They were able to totally relax while away, in a safe and supportive environment. The value of this type of break for carers is enormous and the carers wellbeing is improved for not only the time they’re away, but for months after too, when they are able to continue using the skills they have practised during the retreat. Following on from the retreat the group’s work formed an exhibition which has been shown in several venues, to great reviews. A local carer who saw the exhibition felt that it needed to be shared with a wider audience, and donated funds to North Argyll Carers Centre to allow us to produce a book of the work. This involved two extra planning meetings with the group when everyone was feeling a huge boost to their confidence due to the success of the project. Carers will feel better supported to sustain their caring role. A group of 4 carers attended the activity which ran over a 4 week period. Carer B, cares for her elderly husband, who has very limited mobility, and had only recently been diagnosed with dementia before the course started. At the start of the course she was finding it very difficult to manage her time due to her caring role becoming more demanding, which was causing her a lot of frustration. She had also been reluctant to label herself as her husband’s carer. Following the completion of the 4 weeks I received the following letter from her saying, ‘Thanks for all your help and advice. I believe having conversations with other carers, all at differing stages of the caring role led me to thinking a little differently about my own situation. I had been concentrating perhaps too much energy on trying to keep things running as they’ve always been. Time tabling to keep on track. Trying to achieve the same but with much less available time…. Results…. Paddling backwards. So, less time worrying about keeping things the same, because they’re not, and making time for keeping up with friends instead. Already doing this, so all I can say is thank you’. Carer B has continued to manage her time better since completing the course, and her attitude towards her caring role has changed considerably. Helping the carer to feel more in control of her everyday life has also made a massive difference to her relationship with her husband, and they are both much better at living in the moment, and doing more things that they can enjoy together, e.g. Going on holiday for the first time in many years. Groups where other carers can meet and offer peer support, and share stories, and offer advice, are invaluable, especially to carers new to caring.